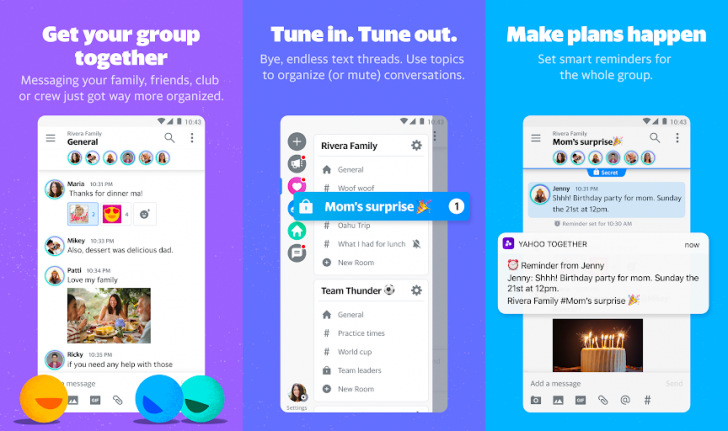 Yahoo‘s new messaging app, Together, is designed to simplify group communication between friends, family, and colleagues. The internet services company today announced the launch of Yahoo Together, a brand-new messaging service designed to organize group messages between family and friends using smart features. The new messaging client will allow users to categorize group chats according to various interests and topics, similar to IRC. There’s also an option to prioritize notifications from discussions you’re more interested in and mute the others you deem to be less important. Like other group messaging apps, users can share photos, GIFs, links, reactions, and so on with other participants, search existing conversations to find what you need, and mute notifications when you don’t want to be bothered. Together also has a handy Smart Reminders feature to send reminders to the entire group at a scheduled time. Additionally, Together functions as a kind of file-sharing platform for members of the chat group, allowing users to attach any file into a shared library. Said library features a search function, making it easier to find what you’re looking for.